Mother Clucker served with a side of pickles, oinions, jalopens, all that are optional. Bored on campus and hungry? Do you need a cool place to hang and eat? Dying to get off campus and try new things? What about a date night for your special someone? There are places in Tyler that can fill those needs. Those college needs. With the cafeteria being convent and Chick-fil-a right on campus, along with Subway. Sometimes you just need to try something new. 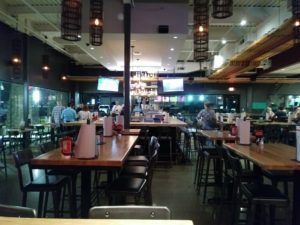 I took a trip around Tyler and found a few places that one could enjoy. Booth at Whataburger at night. 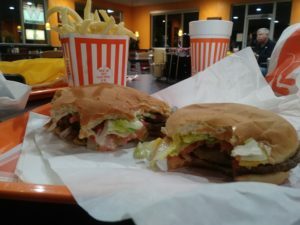 Whataburger on, 1739 S. Beckham Ave., Tyler, TX 75701, is starting our list on “Food for thought” series. Not too far from campus and you can practically walk there. 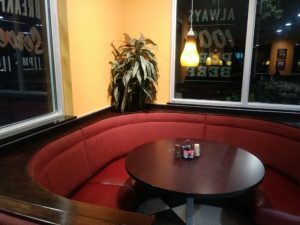 Just imagine yourself at this booth enjoying yourself to a burger and some fries or a chicken sandwich with some sweet tea. With friends or your laptop and books studying while eating. With the staff being friendly to myself and the others in my party, they made me feel welcomed and not rejected. Two burgers sitting on a tray at night. I made sure to check out the bathrooms because fast food places are known to have gross bathrooms. I was happy to see a clean facility. With hands washed and a hungry stomach, Whataburger again did not disappoint this lady. I made sure to get a burger and shared some fries with the group but I did not share my sweet tea. When you go to Whataburger, do you really go for the chicken a sandwich? NO, am I right TJC? 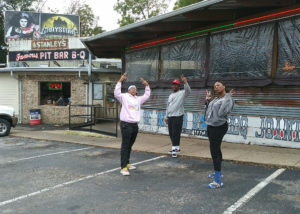 Starting from right to left, Jaylynn Gray, Kendall Mangrum, and Kendria Roberson stand in front of Stanley’s Bbq. Walking up to the bbq place I was unsure of how it would taste but you cannot judge a book by its cover. There have been off the wall places that are good or just bad. Now they do give a cool kick back kind vibe to the place. 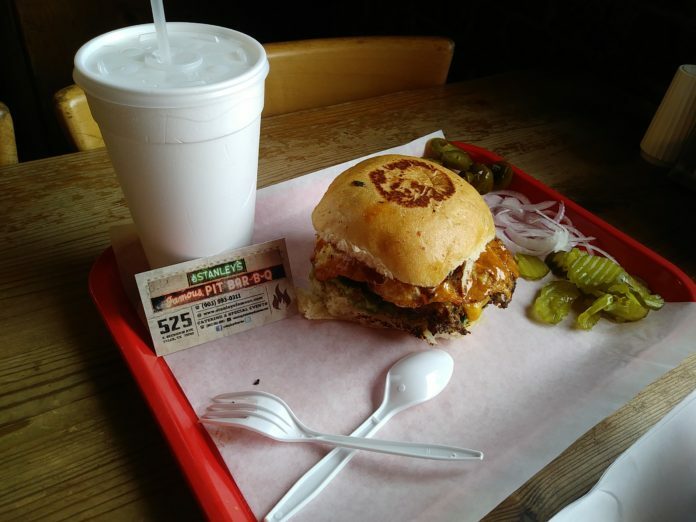 Mother Clucker served with a side of pickles, onions, jalapenos, all that is optional. With a old blue jazz music playing over the speakers I was excited to order. With an outdoor patio that closes off during the cold months. Roberson said, “It tastes so good, it will leave you speechless.” Now I can get down with that. Biting into the Mother Clucker, I was left speechless. Now this place is priced higher. So consider this place when you have a good 10 dollars to spend. So worth it. Their bread is so soft and the flavors just melt in your mouth. I will return to try another one of their funny named food items. People gather around the bar in Grub at night. 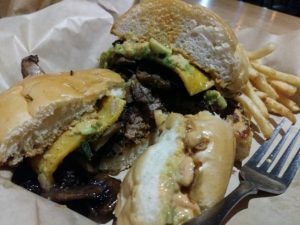 On a date night, I had, I told my special someone to take me to Grub Burger Bar at 6421 S. Broadway, Suite 130, Tyler, Texas 75703. While entering in the Burger bar I instantly feel cool. I can just sit there and talk to my beau or a group of friends and make some awesome memories in there. If your 21 and older you can enjoy an adult beverage with your burger, make sure to get a DD for the ride home. Grub Burger falling apart at night. The best part of Grub is they give fifteen percent off your ticket with a student ID. Who else does not want some money off their food? While I did enjoy the Guacapotle™ with my side of shoe fries. I was able to enjoy the night giggling at my table and eating the said burger. So whether or not on a date or with a group of friends all the places that I have listed will give you that much-needed space to make some college memories. If you don’t have the money to try new places but you’re curious about one, send me an email at ckohl@email.tjc.edu. I will not object to trying vegetarian dishes or vegan ones as well. Give your girl a shout out.